When it comes to Valentine’s Day, don’t spend big, spend smart! The latest report from the National Retail Federation says couples spent an average of $136.57 on their Valentine’s Day gifts and plans last year.¹ And that’s just the average!We think EveryDollar budgeters can do better than that by budgeting better and spending less. After all, when you spend less money on Valentine’s Day, you have more money to put toward saving and building a future together. Take a look at our money-saving ideas and start a new (and less expensive!) Valentine’s Day tradition. 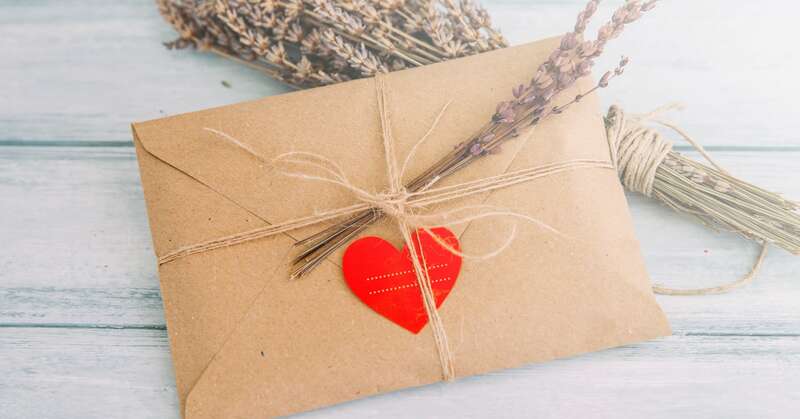 Instead of a store-bought card, write a heartfelt note. Why let a stranger attempt to tell your loved one how you feel? Save the $4, grab a piece of paper and a pen, and spend some time thinking about what makes your sweetie special. Your note doesn’t need to be long, but it should be sincere. Express your love and gratitude in your own handwriting for an easy Valentine’s win. Instead of an expensive arrangement, pick up a simple bouquet. Sure, you could get fancy and order two dozen red roses complete with baby’s breath from your local florist. Roses cost more during the Valentine’s season than any other time of the year, and yet they still only last about a week.² For blooms that are just as pretty at a fraction of the cost, opt for a $5 nontraditional bouquet from Trader Joe’s, Aldi or your favorite grocery store. Instead of a box of chocolates, grab a chocolate bar. Would you rather take a gamble with every bite or enjoy a sure bet from start to finish? A lovely, premium chocolate bar is less expensive and less risky than an over-the-top box of chocolates. Score extra points by pairing your love’s favorite bar with additions like caramel, almonds or hazelnuts. Instead of a dinner reservation, make dinner at home. Couples spend an average of $96 to eat out on Valentine’s Day.³ You can take half (or less!) of that to the grocery store for all the ingredients you’ll need to whip up an impressive meal. While you’re at it, go ahead and make an experience out of the evening. Treat your sweetie to a drink and some background music while you get to work. Better yet? Make the meal together. Instead of a night on the town, host a movie marathon. Valentine’s Day isn’t just for couples. Bring the cost of your Galentine’s extravaganza down by inviting your girlfriends over for a night in. Ask each friend to bring an appetizer and a movie—even if it’s a romantic comedy she loves to hate. With access to the library, already-owned DVDs, Netflix, and Amazon Prime, your options are just about endless and basically free. Provide dessert for your gal pals and enjoy! No matter how you celebrate Valentine’s Day, always remember to make room for fun (and love!) in your EveryDollar budget.